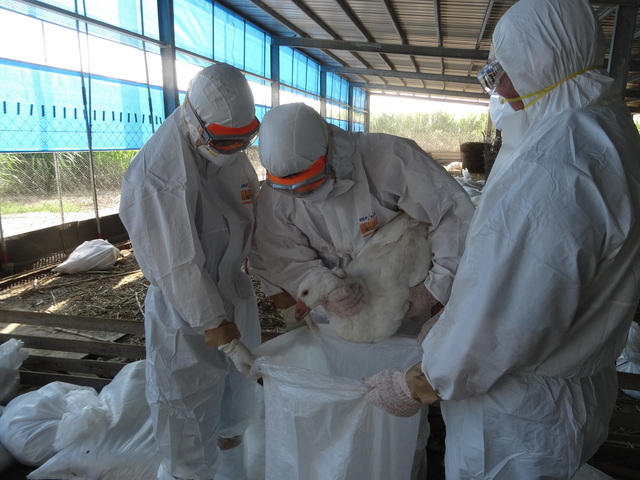 On 2018/5/18, Taiwan government confirmed an avian influenza outbreak in Tainan. Testing result reveals the abnormal death of roues were infected by H5N2. To prevent epidemic from diffusion, the local authorities had culled more than 2,000 geese. The bird flu had caused serious economic losses recently, therefore, governments rises highly attention to any suspected cases. In this incident, the frontline workers handling the culling wear ULTITEC 2000 to protect themselves from potential hazardous and threat of contamination. It is designed to protect workers against liquid splash or particulate and biological agents. 1.Avoid staff from infected by virus when working in the hot zone (infection zone). 2.Prevent the virus from spreading to non-contaminated areas and cause more serious disease outbreak. 3.Protect frontline workers’ safety from contamination when cleaning, disinfecting, and using chemicals. ULTITEC 2000 passed WHO protective clothing standard for preventing Ebola epidemic. It’s not only waterproof but also breathable. It resist anti-blood, body fluid and even virus.